With an advent of the VR market, using 360-degree cameras to create Cinematic VR (CVR) experiences opened up a prominent question that can challenge the traditional film narratology. Additional fields of view are allowed so the viewers in CVR can move their heads to choose more attentive and informative scenes, but frequent scene changes are not welcomed due to VR nausea. These technical drawbacks (and/or advantages) demand a new narratology for CVR, in particular, how the director of CVR can convey certain narratives to the viewers in conjunction with how he/she can attract the viewers to look at the acting persons in the 360-degree scenes. In this study, we employed well-established underpinnings of both eye contact and gaze, by which the acting persons in CVR can effectively convey the narrative structure, and, at the same time, more attentiveness from the viewer in CVR can be ensured. 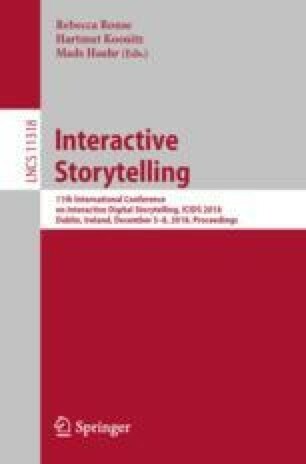 We completed two versions of CVR, one with the traditional film narratology and the other for the new CVR narratology (i.e., eye contact and gaze) proposed in this article, and are now in the stage of evaluation. Our preliminary results showed that the viewers in the CVR film with more eye contact and gazes effectively presented the narratives of the film and also were more satisfied with the CVR environment.